↑ "Alone: Bipasha Basu praised, Karan Singh Grover ignored?". http://timesofindia.indiatimes.com/entertainment/hindi/bollywood/Alone-Bipasha-Basu-praised-Karan-Singh-Grover-ignored/photostory/45451687.cms. ↑ Bollywood Hungama. "Hate Story 3". http://www.bollywoodhungama.com/moviemicro/cast/id/3129301/Hate%20Story%203. ↑ "Karan Singh Grover to play Vishnu – The Times of India". 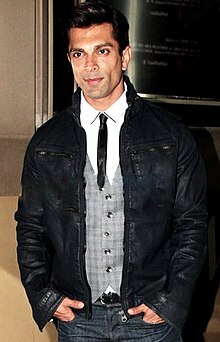 http://timesofindia.indiatimes.com/entertainment/hindi/bollywood/news/Karan-Singh-Grover-to-play-Vishnu/articleshow/49074059.cms. ↑ "Karan's waiting for the right girl". Timesofindia.indiatimes.com. http://timesofindia.indiatimes.com/entertainment/hindi/tv/news-interviews/Karans-waiting-for-the-right-girl/articleshow/8761757.cms. ↑ "Photos: Fifty shades of Karan Singh Grover!". http://www.filmibeat.com/television/news/2013/photos-fifty-shades-of-karan-singh-grover-asad-114355.html. ↑ Somashukla Sinha Walunjkar (25 جون 2012). "Big icons of small screen!". The Times of India. http://timesofindia.indiatimes.com/entertainment/hindi/tv/news-interviews/Big-icons-of-small-screen/articleshow/14386410.cms. ↑ "The strong & silent TRP-trippers of small screen soaps". Timesofindia.indiatimes.com. http://timesofindia.indiatimes.com/entertainment/hindi/tv/news-interviews/The-strong-silent-TRP-trippers-of-small-screen-soaps/articleshow/17428958.cms. ↑ "Indian Television Dot Com – 'Idea Rocks India' – Audition in Mumbai on ستمبر 7". 5 ستمبر 2009. http://www.indiantelevision.com/release/y2k9/sept/septrel20.php. ↑ "Star Plus presents Holi special ‘Masti Gulal Ki’ | Best Media Info, News and Analysis on Indian Advertising, Marketing and Media Industry.". http://www.bestmediainfo.com/2014/03/star-plus-presents-holi-special-masti-gulal-ki/. ↑ "Thank You Maa: Gurmeet Choudhary, Karan Singh Grover, Divyanka Tripathi's mind blowing Mother's Day celebration!" (in en-US). http://www.bollywoodlife.com/news-gossip/thank-you-maa-gurmeet-choudhary-karan-singh-grover-divyanka-tripathis-mind-blowing-mothers-day-celebration/.